The Eagle Rabbid has landed at Big Al’s! 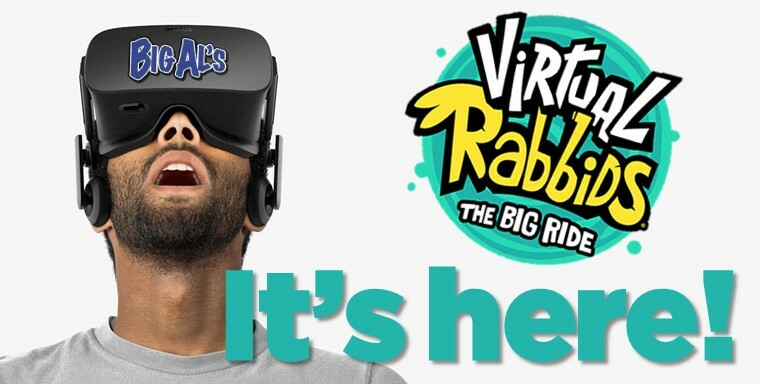 It’s been a long time coming, but it’s finally here: Virtual Raddids – The Big Ride! Yes, we’ve had a host of calls for more VR at Big Al’s, but haven’t been super comfortable with the technology and guest experience… until now! The Big Ride is AMAZING — you have to come in and experience it for yourself! Perfect for all ages… and now perfect for Big Al’s! *Please note that VR games are not included in Happy Hour or Late Night Unlimited Play pricing.